One month shy of 30, Rory McIlroy - somehow - remains a boy to us. Still mop-haired and goofy and oddly fragile in our thoughts, still that kid who got lost down in the valley on ten. The one who stood top of the hill, rattled but still leading the Masters. Who walked off a green at the bottom, seventh and aching for home. He's won four Majors since, putting a torch to some of golf's most famous stretches. He's rewritten how nature built him. He's had more epiphanies than Aristotle, won more money than a single person could ever need or use. But, in Masters week, muscle-memory cannot possibly be his friend. This is McIlroy's fifth time heading for Georgia to a soundtrack of the golf world's fixation with whether or not he has what it takes to join those high priests, Sarazen, Hogan, Player, Nicklaus and Woods, as career Grand Slammers. A year ago, he pulled the curtains on Masters Saturday, talking up his chances and, specifically, the appeal of a Sunday street-fight with Patrick Reed. "Going to show everyone what I've got..."
"All the pressure's on him tomorrow..."
"Hoping to spoil the party..."
It was as if he'd forgotten the bloodshed of Hazeltine. As if Rory was trying to be someone or something that didn't quite rhyme with what seems to reside within. Then he missed that eagle putt on two; took an iron to the tee on three. And you knew he remembered everything. McIlroy at his best is extraordinary. His golf can seem fearless, lawless even when confidence is up, a talent glowing like a magnesium flare. Yet the grumbles we have for him run into petty multiples. Four years and eight months since that last Major at Valhalla, the human instinct is to wonder if the stony kid who blanked Rickie Fowler and Phil Mickelson on a congested sixth tee even exists anymore. The one who'd won the PGA at Wentworth that May just four days after calling off his wedding to Caroline Wozniacki. Who was Open Champion at Hoylake two months later. Who then won the Bridgestone Invitational at Akron. The guy who had could sit on that Valhalla bench, blanking everybody around him. Maybe a white man's version of Tiger. Cold. Tunnelled. Unreachable. 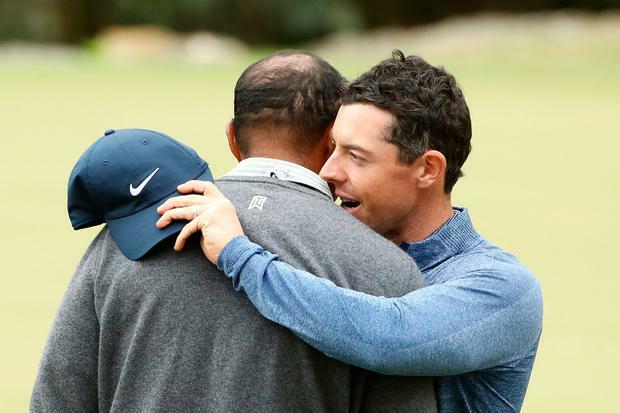 When McIlroy went to Sawgrass last month, the only noise in his ears was an audience's obsession with nine final-pairing failures in just over a calendar year. 'Sunday issues' is the industry term. A snapshot? Last September, we watched that familiar jaunty stride as he chatted amiably to Woods, that great dam of people rupturing behind them on 18 at East Lake. And all a cynic's eye could see was someone maybe happy just to be the legend's friend. Tiger's 80th Tour victory. Five years and a hundred soap operas after his 79th. Hug time. Rory shot 74 that day; the same ugly figure posted at Augusta when left watching Reed's heels. Remember the Sentry Tournament of Champions last January? Starting Sunday in second place, three shots off the pace? Shot 72, the worst score of anyone finishing top 20 in a 33-man field. That's what we'd come to see when looking at Rory McIlroy. Weakness. Yes, his form heading to Sawgrass carried astonishing consistency (tied 5th at Farmers Insurance Open; tied 4th at Genesis Open; 2nd at WGC in Mexico; tied 6th at Arnold Palmer). Always there, always close. But where was the Sunday edge? So those birdies on 15 and 16 to squeeze old Jim Furyk out of The Players' Championship? Did they signify the ultimate answer? Just mid-March after all and close to $5 million prize-money already banked on Planet McIlroy. Asked afterwards in an NBC Golf podcast if he considered himself the best player in the world, Rory didn't equivocate. "Yes," he told host, Carson Daly, emphatically. "I think when I've got everything firing on all cylinders, you know I believe that I could go up against anyone and beat them!" W-E-A-K-N-E-S-S. Is it possible to imagine a word of greater audacity lifting from the rippling keyboards of a press-room? In McIlroy's case, maybe a Ben Hogan line should come to mind. "I am the sole judge of my own standards," Hogan famously once declared. Persimmon might have long since given way to titanium, but some old truths remain inviolable. One surely is that someone who can win again and again in tournament golf cannot, logically, be weak. In fact, someone who can do it in an environment so swamped with moral opportunists, sociopaths and the monumentally self-absorbed must have depths unimaginable to the rest of us. Our frustrations with Rory are, in truth, enduring articles of faith. He is the rarest of shooting stars, the miracle product of a small village in Co Down who outgrew us before he'd even left his teens. The geeky little schoolboy, chipping balls into a washing machine on a UTV chat-show. The stockpiling adolescent... Irish Boys; Irish Youths; Irish Amateur; West of Ireland; Irish Close; Mullingar Scratch Cup. A smiling champion in every clubhouse he stood; his dad, Gerry, as chauffeur, wise counsel and - we know now - reluctant intimate of every expletive uttered in the debut Hip Hop album, 'Get Rich or Die Tryin', of that noted philosopher, 50 Cent. That was the soundtrack to their cross-country safaris. Maybe a bit of Linkin Park too or Blink-182. If Gerry himself preferred The Eagles, the music was decided by his self-confessed "skater dude" son. Funny, for Rory's first Masters in '09, he found himself missing all of that, missing being at home in Holywood, he and his Da waiting for the theme music to that evening's broadcast from Augusta. Just that simple sense of watching the gods through a long lens as distinct from, now, breathing the same air. But somewhere along the way, Corporate America signed McIlroy up for Monopoly money and the safe intimacy of that old world became a memory. He grew global. The kid who got lost in that Augusta valley eight years ago became US Open champion just 70 days later. He was taking phone calls from Greg Norman. He had Nike's undivided attention. He became a human oil-well. It would have been odd if it didn't change him but, maybe, the miracle of Rory McIlroy is just how little it has. The compelling, four-hour interview he gave Paul Kimmage for the Sunday Independent early in 2017 stands as a model of candour, intelligence and adult self-awareness. It ran contrary to the robotic, soullessly evasive, country club language deployed by so many of his peers in their interaction with media. In fact, in it Rory achieved something remarkable. He managed to communicate a grown-up understanding of the absurdity of the world around him. US golf journalists consider McIlroy a virtual rebel in that regard. Because he ventures opinions. He answers questions. He engages with the idea that, maybe, there are more challenging missions to be cursed with in life than trying to solve a hit-and-miss putting stroke. His stance on the Rio Olympics was a case in point. While so many contemporaries jumped on the Zika virus nonsense as a kind of fire escape, McIlroy did the subversive thing of telling the truth. To be an Olympian, he'd need to stand behind a specific flag with all the convenient spites and prejudices that that would then entangle him in. "I don't know the words to either anthem," he said flatly. "I don't feel a connection to either flag. I don't want it to be about flags. And I hate that term 'growing the game'. "Do you ever hear that in other sports?" In other words, the kid who grew up on the Belfast Road in Holywood, who played Gaelic for a year in St Patrick's Primary School but was always more taken with football and rugby, who never once felt a need to raise his voice about religion in a society so governed by that very noise, chose not to be someone else's symbol. But, then, that's surely the essence of McIlroy. It isn't that he's ever been inclined to run from his past, rather that he refuses to allow others define it. In that NBC podcast after his win at Sawgrass, he didn't sound anything like the distant, Americanised, over-logoed human billboard some like to depict. If anything, his words seemed remarkably anchored and sane. He spoke of a preciously private tableau in the locker-room after, sipping a glass of wine with wife Erica, caddie Harry Diamond, and manager Seán O'Flaherty. "They're the moments that you remember and that you cherish," he said. He talked of his hopes of starting a family "that would be the biggest win of my life" and of how teenage friendships have survived the blizzard of fame and celebrity. "I've got a lot of friends outside of the business," he explained. "A lot of friends that knew me before all of this. And I think the more friends you can have like that, the better. "They know the cocky little kid that grew up in Holywood, Northern Ireland and told everyone that he was going to be the best player in the world. You know, they could tell some stories about me that I wouldn't want being told..."
When you think about it, we want so much of McIlroy today that is impractical, contradictory. We wanted him to play the Irish Open in Lahinch out of loyalty. But to who or what exactly? To the tournament? To host, Paul McGinley? Without McIlroy, there would be no Irish Open today. And what exactly is it that he owes McGinley? McIlroy flagged the problem with scheduling a long way out. He is single-minded in his desire to approach The Open at Royal Portrush as he specifically chooses, not as the calendar dictates. And bear in mind his words to Kimmage about that Irish Open win, as tournament host, at The K Club in 2016. To this day, his Twitter avatar is of him striking that extraordinary five wood to the eighteenth green in Straffan. The Irish Open, he says, was always the one tournament his mother, Rosie, wanted him to win. "There's other tournaments that people would deem more important but those other tournaments haven't meant as much to me as the Irish Open," he tells Kimmage. "And I was very emotional afterwards for a number of reasons: because of the prize-money and where it was going (he donated the winner's cheque to charity); because of what it meant to me; and because of what it meant to my mum." McIlroy has, over time, come to recognise how history judges with a cold eye. How a man is measured ultimately on what he wins, not who he humours. Yesterday it was 2011, that's how is still feels with McIlroy and Augusta. "I was just gone, completely gone." All just history and old newsprint today, right? After all, other than that Saturday 77 in 2016, McIlroy has since always looked relatively comfortable on golf's most precious lawns. He returns this time as Masters favourite too. The form player. The one most capable of cutting corners around Augusta National. Of shooting low and repeating it. But the unknowable, for now, is whether or not he can win from a congested leaderboard next Sunday. We still see him as the guy who can obliterate a field, as he did with that 16-under at Congressional in 2011. But can he win a Major arm-wrestle? Especially in this storied place with so many personal ghosts in the pines? Sunday, last year, sets you wondering. Rory talked the talk, then unravelled after that missed eagle putt and was gone by the turn. He picked a fight with a man who'd previously drawn something out of him at Hazeltine that - he admits - left him "a little tired, a little mentally fatigued". Someone who is a natural street-fighter. McIlroy thrives, not on anger, but momentum. On staying true to himself. On being focused, not edgy; clear-headed, not mean. On being the kind of guy who could have a smiling lunch with Sergio Garcia immediately before going out with the Spaniard as the final Bridgestone pairing at Akron in 2014 and starting birdie, birdie, birdie. It's only human to worry, almost five years on from Valhalla, about McIlroy and Majors. Arnold Palmer, after all, won all seven of his between 1958 and '64. Tiger's 14th and last (thus far) arrived when he was 32. Bobby Jones retired at 28; Byron Nelson at 34. And never before has the game looked so heavily seeded with fearless, young, blank-eyed talents. So, for Rory to win at Augusta this week, he must chase down our doubts as well as his. Because everything around him will rattle with stories of the past. With memories that can weigh on the chest. Suffocate. In Sawgrass two weeks back, though, he sounded like someone fully cognisant of all this. Someone ready for that din. "I don't define myself by who I am as a golfer anymore," he said in a Golf Channel interview. "I'm very comfortable with who I am as a person and very comfortable with who I am as a golfer. But in no way are these two things ... I used to shoot 65 and be happy; shoot 75 and be sad. You need to have a better perspective than that. "I think my wife probably had a lot to do with (changing) that. But I've started to spend time with some people and they've ... you know I've figured it out on my own. "I've read a few books over the last few months, whether you want to call them self-help or psychology or whatever, but I've just gotten to the point where I'm more comfortable with myself. "And I think a by-product of that is being comfortable with... you shoot 74 or 64 out there... at the end of the day, the people that love me are still going to love me." Maybe all those words are just in service to some kind of denial mechanism. Aimed at softening the glare of endless scrutiny. But in a sport so in thrall to wooden, wall-motto cliché, they sounded real and plausible and human too.